This above passage of Pausanias is not well attested elsewhere, but it does agree in part with several extant traditions of Alexander at Smyrna and is also detailed on Roman Era coins from Smyrna. Since the founding story of Hellenistic Smyrna that Pausanias relates is also on the Roman Era coins, many minted from the mid-third c. CE under Philip the Arab, it confirms at least the legend rather than fact. As Karsten Dahmen notes, “looking at the coins, we find every detail mentioned in this story.”  The double Nemeses at Smyrna were an old civic tradition, and Dahmen also suggests that the twin goddesses may represent “an echo of a statue group of these goddesses erected in Smyrna”. There is also remnant epigraphic evidence of Smyrna’s twin Nemeses still seen in the Agora of Roman Era Smyrna, as I saw recently on November (see below photo). One can still read, on a white marble block of a presumed architrave, a dual line above dentils. This fragmentary inscription reads NEMESE[__] in the above line and TON SEBAST[__]…on the lower line. That it is a dual Nemesis is manifest in the final remnant “E” in the name rather than a singular “I”. Although the full context is not given here, that there was a shrine and altar to Nemeses at Smyrna is also known, and Tataki associates Nemesis contexts with gladiatorial games at Smyrna  since she was also a patroness of gladiators. Many accounts have placed the Nemesis shrine up on Mt. Pagos itself rather than around the Agora where the fragmentary inscription is now placed within the Agora enclosure, but Tataki’s study offers the most relevant contexts. In my photo, the Pagos Hill (Kadifekale) can be seen on the high horizon behind the mounted inscription, a hill covered with cypresses (near the enormous Turkish flag on the summit). The old Greek goddess Nemesis, daughter of Night by many but not all accounts, was a deity of divine retribution often believed to punish hubris and make proportional balance for an excess of one-sided good fortune (Tyche), especially when improperly appropriated or not sufficiently respected. In other Greek myths Nemesis, not Leda, is the actual mother of Helen of Troy and that Leda merely found the resulting egg from the mating of Zeus and [winged] Nemesis (Pseudo-Apollodorus, Bibliotheca 3.127; Pausanias, Description of Greece 1. 33. 4 in his description of Rhamnous’ Nemesis Temple although Pausanias is not alone in naming Okeanos as the father of Nemesis). Although this deity was also at times perceived as a duality to be begin with (Nemesis-Tyche), it also makes some sense that Smyrna would have a dual deity – one kindly, one implacable – for this balancing role especially since some suggest there was a Nemesis for both the old city of Smyrna and the new one. At least one other suggestion about Nemesis is that she was not even Greek but Anatolian and originating here around Smyrna. The so-called Tyche of Alexander is already well published elsewhere,  but his presumed willingness to obey in to the legendary dream would also make sense given his quest for conquest of Asia and his perceived need for divine allies. Antiquity is not the only time when the duality of Nemesis is manifest: Albrecht Durer’s famous 1502 serene Nemesis (so named from his notebooks) but ambiguously subsequently also referred to as The Great Fortune, is balanced deliberately precariously on a small globe with insufficient room for both feet and one foot apparently slipping off, exhibits both the cup of blessing and the bridle for either necessary response. In 1843 Antoine Chenavard published a Smyrna Agora view of one surviving side of the row of Roman columns on their pedestals. 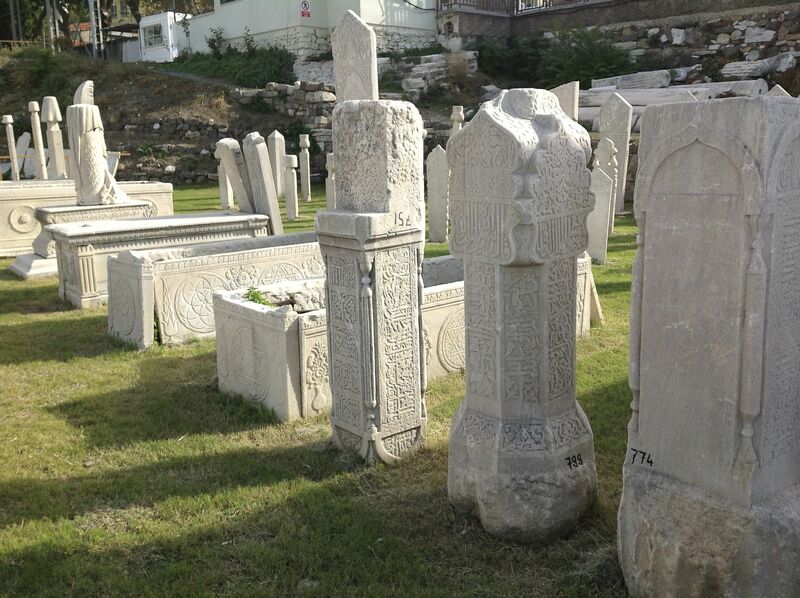 In his foreground are the beautifully-carved Ottoman Islamic cemetery headstones, now moved but also still seen at the Agora on the southeast side, as in my photo below, showing the Turkish respect for archaeological remains and religious artifacts from all periods, including their own Ottoman history. According to the same Alexander-Nemeses legend, after hearing of Alexander’s dream, the people around Smyrna inquired of the Oracle of Apollo at Claros  (also see Ovid Metamorphoses XI.413) in Ionia north of Kusadasi and were told they would be three or four times happier than previously if they moved their city from the old to the new location beyond the sacred Meles Stream. Although it is hard to configure the watershed of the ancient stream through the much-disturbed Izmir contexts, there are residual springs like the possible old Meles (modern Yeşildere?) 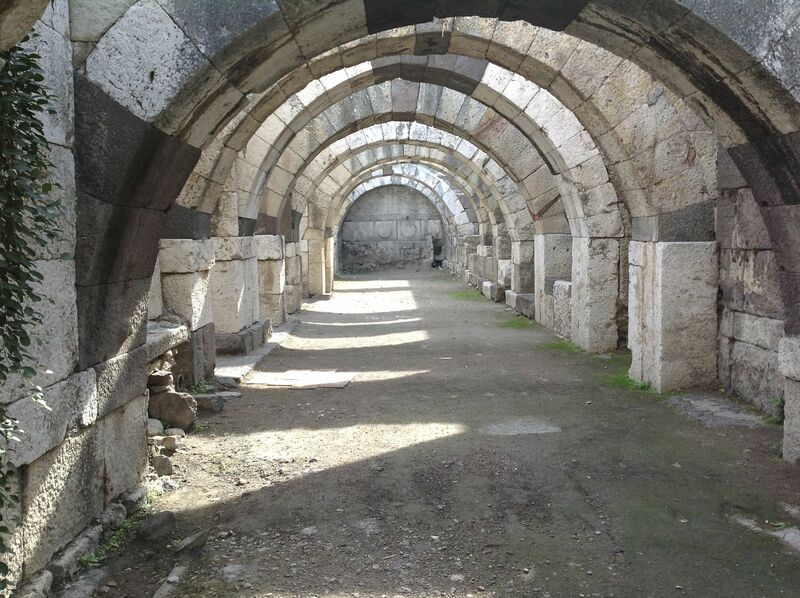 whose waters still flow underground down from Kadifekale’s (Pagos) plateau through the much-disturbed Agora as the trickle can still be seen in the arcaded “Cryptoporticus” there below the ground level Agora. 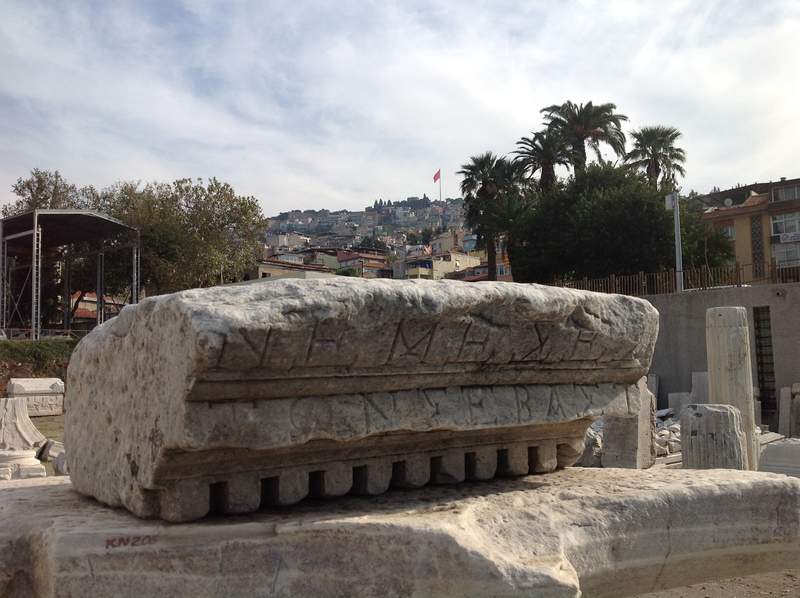 As a somewhat ironic concluding aside here, when I was a graduate student at the American School of Classical Studies at Athens, one of our archaeological study visits was to Rhamnous, famous for, as mentioned, among other sanctuaries, the unfinished but utilized fifth c. BCE Nemesis sanctuary. At the time, I took many photos of this Nemesis context, and to my uneasy chagrin, this particular rolls of slide film in 1984 was so damaged that these photos were ruined and only partly visible, the only time this has ever happened to my photos. At the time, I took it as somehow apropos for me personally. Fortunately, and I assume equally apropos, the 2012 Smyrna photos of this local Nemeses artifact came out perfectly fine. I feel particularly good about this second event, but not overly so. Pausanias, Description of Greece 7. 5. 1 (trans. W.H.S. Jones), Harvard-Loeb, vol. III. (Heinemann) 1933. Margaret Miles. “Review of J. M. Cook, R. V. Nichols, Old Smyrna Excavations: The Temples of Athena. With an Appendix by D. M. Pyle. Annual of the British School at Athens, Supplementary Volume No. 30. London: The British School at Athens, 1998” in Bryn Mawr Classical Review 02.40 (2006) and 2009; Patrick Hunt. “645 BCE: Lydia’s Rise to Power under the Mermnads” Ancient World: Great Events, vol. 1, (2004) 331-32. J. F. C. Fuller. 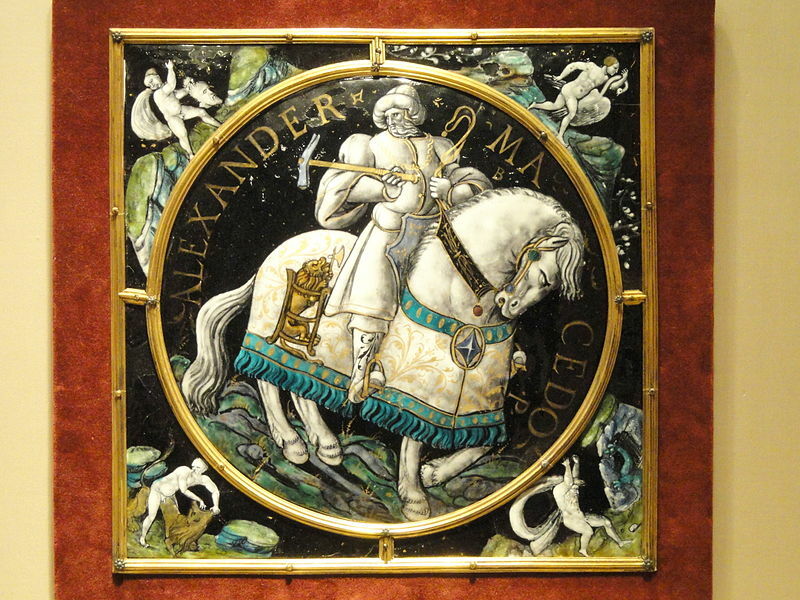 The Generalship of Alexander the Great. New York: Da Capo Press, 267. Strabo. H. L. Jones, ed. The Geography of Strabo,vol. 6. Cambridge, MA: Harvard University Press (London: William Heinemann, Ltd., 1929), 1970 ed. Peter Kuniholm. “Trees” in Eric M. Meyers, ed. The Oxford Encyclopedia of Archaeology in the Near East. New York: Oxford University Press, 1997, 347-49; P. H. Davis. Flora of Turkey (vol. X, Flora of Turkey and the East Aegean Islands). Edinburgh: Edinburgh University Press, 1989, 251, 451. 480. Karsten Dahmen. The Legend of Alexander the Great on Greek and Roman Coins. New York: Routledge, 2007, 129-30 & Plate 15. 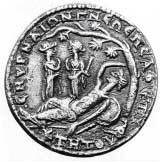 In the fragmentary accusative TON SEBAST[_] is some form of the basic meanings of “veneration, honor or reverence”, also often used in reference to an emperor. H. G. Liddell and R. Scott. Greek-English Lexicon, Oxford: Clarendon Press, 1996 ed., 1587 ff. Argyro B. Tataki. “Nemesis, Nemeseis and the Gladiatorial Games at Smyrna.” Mnemosyne 62 (2009) 639-48. Hesiod, Theogony 223-24, Theognis, Elegies 279-80: “It seems the bad man does not understand the ways of Justice, he has no fear of Nemesis to come” (Dorothea Wender, tr. Hesiod and Theognis, New York: Penguin Classics, 1976, 106). Nancy Bookidis and Ronald S. Stroud. “Apollo and the Archaic Temple at Corinth”. Hesperia 73 (2004) 401-26, esp. 404. A. Trevor Hodge and R.A. Tomlinson. “Some Notes on the Temple of Nemesis at Rhamnous.” American Journal of Archaeology 73.2 (1969) 185-92, esp. 192 where the authors suggest the outbreak of the Peloponnesian War may not be the only reason for the unfinished state, although they offer no other more plausible reasons in the article at hand. I still show these ruined photo images in my classes as both a tongue-in-cheek example of Nemesis to my students and a healthy check to myself.